It was chance that brought this dog to a sympathetic doorstep on Christmas Day. And chance that carried him to the care and attention he so desperately needed. So this battered holiday orphan was given the name Chance, after being found wandering a yard in Michigan City, Indiana, with broken bones and a mouth taped shut. "Friends and I were celebrating Christmas when a stray dog came into the back yard," a poster claimed on Reddit. Chance was rushed to North Central Emergency Veterinary Center. Then Sherri Christopher of animal rescue group Guardians of the Green Mile got the call. She was at home, eating Chinese food on Christmas Day, and nursing another battered dog - a refugee from the fighting ring named Edwin - when the veterinarian called. A dog had been brought in by a Good Samaritan. Both hips broken. Foam coming out of his nose. He could scarcely breathe. The surgical costs would be high. Would the Guardians be able to help? "And I said, 'Absolutely, we're going to stand up for this guy. He's got the will. We've got the backing.'" A mass of dead tissue had to be removed from Chance's mouth. His upper lips were almost gone completely, rubbed down to his gums. And those broken bones? The group believes his hips were stomped on. The bones will eventually mend. So too, his mouth. All that remains is his heart. But already Chance is showing every sign of healing that, too. "His personality was really what saved his life," Christopher tells The Dodo. His tail never stopped wagging. For updates on Chance's road to recovery and information on when he will be ready for adoption, follow Guardians of the Green Mile on Facebook. 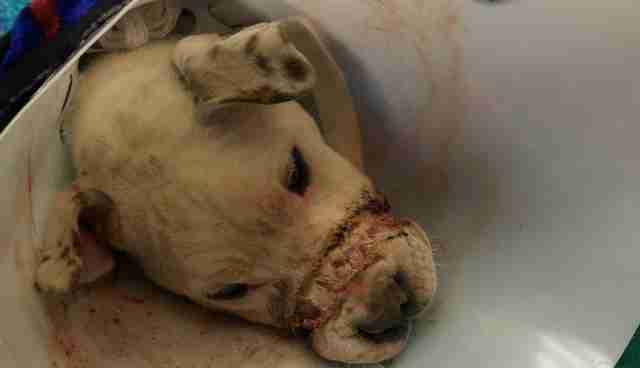 Not every battered dog chances upon the right doorstep. There are a few ways you can report animal abuse online. You can also help support dogs like Chance by making a donation to Guardians of the Green Mile here.